Kin-Ryu, the Golden Dragon, looks more green than gold, originally uploaded by Camemberu. 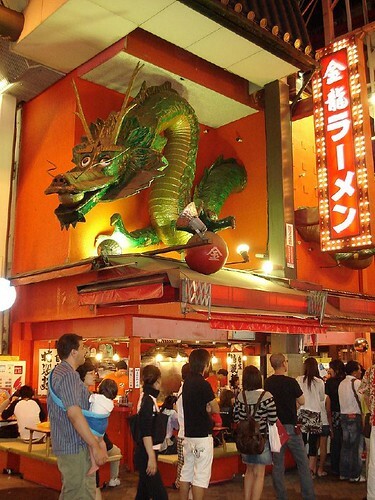 When I first heard about the Kin-Ryu ramen in Osaka with a huge dragon mascot, I thought no way was I going to eat at such a tacky joint. But I was later lured by tales of a good tonkotsu broth. When I saw the actual place, it was much smaller and more humble than I expected. You dine al fresco on raised tatami platform seats surrounding the open kitchen. Menu choices? 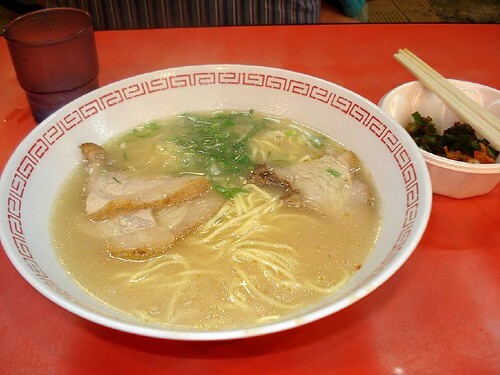 Only two - ramen (¥600) and ramen with extra char siew (¥900). You feed a vending machine your selection and join the queue. A waiter then hands you your table number. Hmm, this is it for ¥600, originally uploaded by Camemberu. OK, a very plain but huge bowl of noodles. I thought it tasted like instant noodle broth. Well, I do like instant noodles, so this wasn't completely objectionable. But I did think it was ¥600 too much. Hubby's reaction was worse - he took one bite and gave up. This certainly ain't no Kyushu Jyangara Ramen. Well, if this is any consolation, you get refillable ice water and kimchi (pickled lettuce and pickled spring onions - bewarned, both extremely pungent), on a self-service basis.